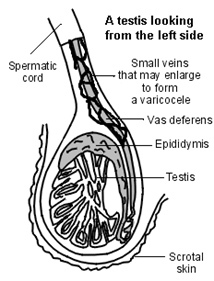 A varicocele is a collection of enlarged (dilated) veins in the scrotum – similar to varicose veins that occur in the legs. It occurs next to and above one or both testicles. A varicocele often produces no signs or symptoms and is rarely painful. With time, varicoceles may enlarge and become more noticeable. An embolisation is a procedure performed to eliminate blood flow to the abnormal veins (varicies) and redirect blood flow to normal veins. A specialist known as an Interventional Radiologist often performs this procedure. It involves the injection of contrast (x-ray dye) to visualise both the normal and abnormal veins of the testes. The contrast is injected through a thin plastic tube called a catheter, which is passed through a sheath inserted into the femoral vein. In young men, the presence of a varicocele impairs sperm production and can often be improved with treatment. The contrast can cause a warm flushing or burning sensation. It only last for a few seconds and stops once the contrast has stopped being injected. Please ring MIVIR if you have a known allergy to Iodine or contrast. You may be required to take some time off work – please let the nurses know so they can organise a medical certificate for you. An attendance certificate can be provided if required. You will need to present to the Day Procedure Unit on the day of your procedure. This will allow the nurses time to complete your admission paperwork and any other tests that may be required such as blood tests or pre-medication. You will be required to fast for 4 hours before your procedure – this means no food or fluids. You may take any regular medication with a small sip of water. Please continue to take your blood pressure medication. Please bring all of your regular medications with you. You will be required to change into a hospital gown and remove all clothing including your underwear. A cannula will be inserted into one of the veins in your arm or hand so medication can be given before, during or after your procedure. You may need to have some hair removed from your groin crease. You will be taken into the Angiography Suite and positioned on the table. Monitoring equipment will be attached so the nurses can monitor your blood pressure and heart rate throughout the procedure. The scrub nurse will clean the top of your leg with a cold antiseptic solution and then cover you with a sterile drape. Local anaesthetic will be injected into the skin, which will sting for 15-20 seconds. You should only feel pushing and pressure after this. At the end of the procedure the sheath will be removed and firm pressure will be applied to the puncture site for at least 10 minutes. You will be required to lie flat for a minimum of 1 hours after the sheath is removed. During your time in the recovery room the nurses will monitor your blood pressure and heart rate and regularly check the puncture site for any signs of bleeding. You will be given something to eat and drink as soon as you are able to sit up. Your cannula will be removed just before you leave the hospital. If you are staying overnight in the hospital, you will be taken to the ward after a short period in recovery. Rest quietly for the next 24-48 hours. Avoid activities where repetitive bending is required. If you notice any swelling, bruising or pain at the injection site that continues to increase, call an ambulance or present to your nearest Emergency Department.